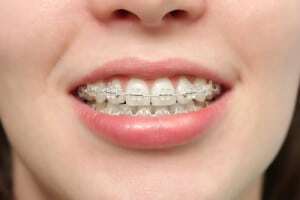 Unfortunately, when it comes to orthodontics problems, there are any number of issues that can crop up, many of which are genetic and simply unavoidable. dhealth Dentistry in Camberwell offers sound, affordable orthodontics advice and care, as well as a wide range of oral health treatments performed by our highly qualified team of practitioners and hygienists. 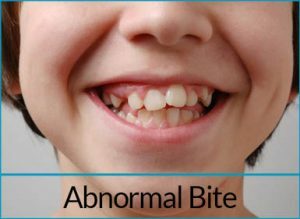 Abnormal Bite: One of the most common oral health issues that people face today, is that of an abnormal bite. Also known as an ‘occlusion’, an abnormal bite refers to the way that the teeth in your upper jaw fit together with the teeth in your lower jaw, which may result in a misalignment of teeth. The molars at the top of your mouth should neatly overlay the ridges and valleys of your bottom molars. 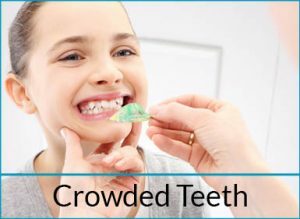 Crowded Teeth: Crowded teeth and irregular teeth are caused by a disharmony between the size of your teeth and the size of your jaw; your jaw might be too small for your teeth, or your teeth too large. Other causes of crowded teeth include a cleft lip or palate, having extra teeth or problems as a result of a jaw fracture. 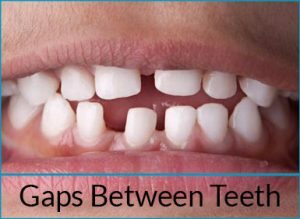 Gaps Between Teeth: Gaps between the teeth are known as diastemas in the dental world. The most common place that gaps occur is in the upper front teeth, but this isn’t the only place a diastema can show up. There are a number of factors behind gaps between teeth. A difference in the size between upper and lower jawbones is a key factor. The size of teeth also plays a role. Teeth that are too large for the jaw will create crowding while teeth that are too small will create spaces and gaps. 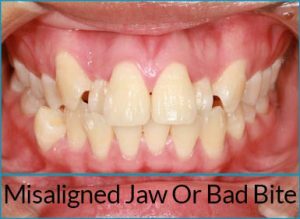 Misaligned Jaw or Bad Bite: A misaligned jaw or bad bite (also referred to as malocclusion) can cause a number of other oral health issues. You may recognise misaligned jaw or bad bite as one of it’s other names, including crowded teeth, cross bite, over bite, under bite and open bite. In an ideal mouth, your teeth would easily fit. There would be no crowding or space issues, and the teeth in the upper jawline would just overlap with those in the lower jawline, so the molars fit snugly into the grooves of the molar directly above or below. Unfortunately, this is not always the case. 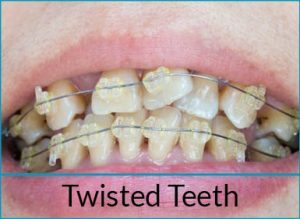 Twisted Teeth: For many, twisted or crooked teeth can be the result of a number of different factors. In some circumstances, some people’s mouths can simply be too small for their teeth; this overcrowds the mouth and results in the shifting of teeth. In other cases, the lower and upper jaw of the mouth might not have formed properly and aren’t the same size, which can result in either an under or overbite.